WHAT: A Summit to discuss the future of The United Methodist Church, centered on POC+Q+T (Person of Color, Queer, and Transgender) voices. Minneapolis is the site of GC 2020, let’s get acquainted! WHO: POC + Queer + Trans People of Faith and Allies, both Laity and Clergy. Scholarships are available. WHY: General Conference 2019 showed the world that some of the most articulate, faithful, visionary leaders of the church are POC+Q+T. And yet, while there are post-GC gatherings planned for leaders who oppose the Traditional Plan, we are yet to see a gathering that specifically centers these wise (and underrepresented) groups. In the wake of the passage of the Traditional plan, how can United Methodists who affirm LGBTQIA+ lives shape the future of the church in a manner that does not continue to replicate racist, sexist, classist, and colonialist structures? How do we articulate a passionate love for God to our communities? What are the non-negotiables for the church moving forward? What is the nature of the problem for which the local church is the solution? How do we want to relate to each other? What are the benefits/costs for staying together as a denomination? Theological: What theological and spiritual understandings must be at the core of our covenant and solidarity? 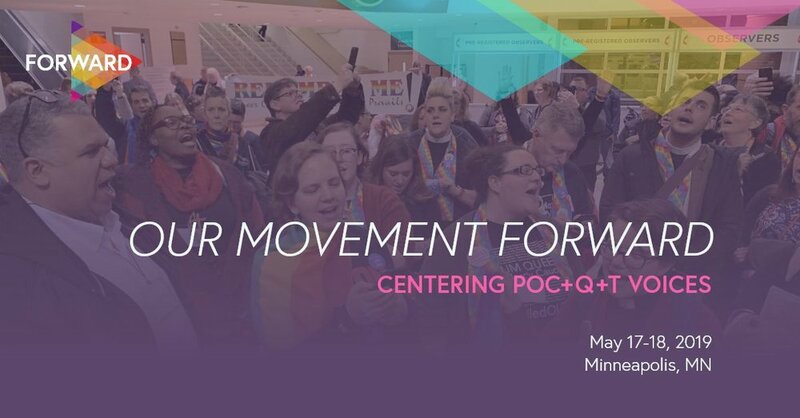 Allies (supporters who are neither LGBTQIA+ nor a person of color) are encouraged to attend on the condition that they commit to centering the underrepresented voices in the room. Please refer to this Collaboration Guide. Please consider donating to offset the cost of the important event, and to provide scholarships to those who need them.